Demo of all cabinetry, lathe and plaster and flooring commenced Monday and was fast and furiously done, giving way to the entirely unsexy but essential plumbing and electrical work that continues on the underguts of the kitchen and future pantry and laundry room (out of view behind the cam). 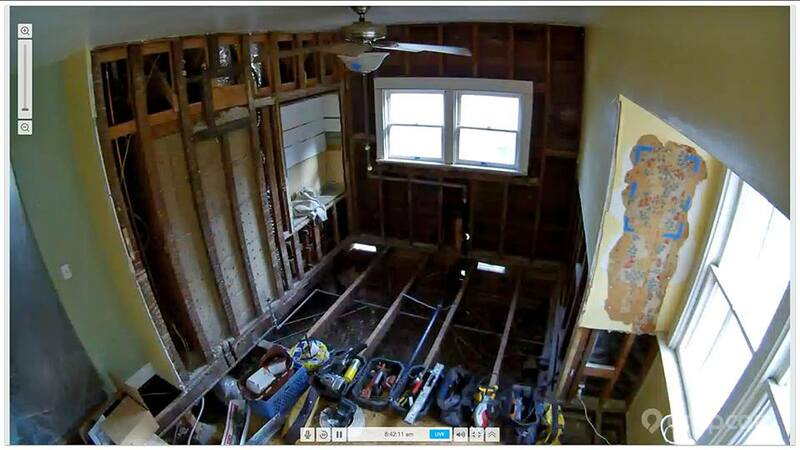 Removal of the laminate wood flooring and subflooring (concrete! and linoleum) revealed a tangled web of pipes and wiring that an inspector would have said “Oh hail nah!” to and so were ripped out and are now in the slightly protracted process of being replaced. In other news that left wall of the kitchen will need reframing. The 2x4s were installed wide side out, which is how they were allowed to build things in the early 1900s, but the opposite orientation is how walls must be built nowadays. And also, we’ll be adding first-time insulation to all the exterior walls. Lastly, if I’m feeling like a particular glutton for punishment, I may give myself a workout today hauling up the pallet of cut Simons bricks that will be our future kitchen floor up to the side yard from the garage where they’ve been all week. Why Simons bricks specifically? Good of you to ask. The Simons Brick Company (roughly 1900-1952), located first in Pasadena and then in what is now the City of Commerce, was a major supplier of bricks for the southern California region, including our 1906 house’s original foundation (replaced in 1999). Susan and I originally considered saltillo tile for the kitchen and pantry, but that just didn’t seem to fit in to the Craftsman style. So we thought about brick as having a stronger connection and then we wondered how awesome would it be if we could find enough Simons bricks, have them cut to paver depth and install them. When that initially proved a pipe dream, we considered reclaimed-look brick tiles from an array of manufacturers but the color and consistency wasn’t quite right. 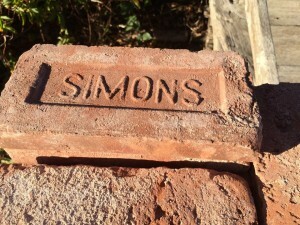 Rather than settle, Susan undertook an epic expedition and in what was something of a miracle finally found a salvage yard in the South Bay that not only had plenty of Simons bricks onhand, but bonus: could cut them as well. In doing so we went from spending about $12 per square foot for the flooring of our kitchen and pantry to $4. And now a pallet of them sits in my parking space in the garage. We’ll see if they’re up in the sideyard and I’m exhausted by the end of the day. This entry was posted on Saturday, August 23rd, 2014 at 7:33 am and is filed under home economics. You can follow any responses to this entry through the RSS 2.0 feed. Both comments and pings are currently closed.